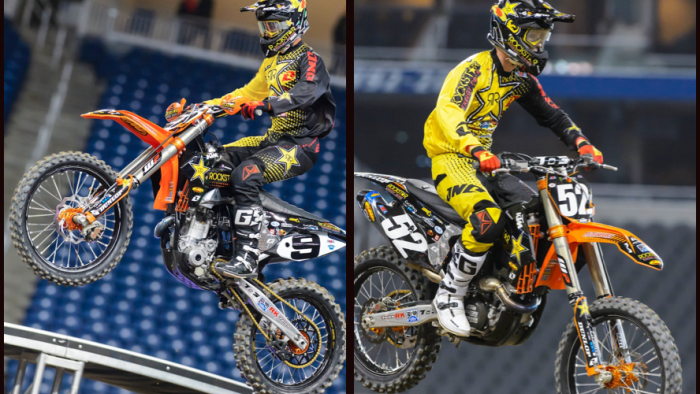 The 2014 Supercross season made it's return to Detroit, MI for the first time in several years. It's amazing that Ford Field brought in a sold out crowd in a city that is over halfway deserted. Not only are there abandoned homes and full neighborhoods, but also skyscrapers and factories and entire industrial areas. Somehow the stadium was still packed. The track also had something seldom seen on modern layouts, an uphill and downhill. The course went a significant distance up into the stands and was very steep, mimicking and outdoor style elevation change. While that creativity was welcomed, the track still posed a one lined effect. Lap times were very tight and passing was kept to a minimum. Ivan Tedesco found himself on the ground in the last lap of the final practice in Daytona. The incident rendered him unable to race the night show in Florida. His head was a bit foggy from the crash but he also had a lot of pain in his right hand. His finger turned very black and blue and ballooned with swelling to the point where it looked more like a toe than any digit you would be comfortable seeing on your hand. Ivan made a brief attempt at riding midweek but was quickly forced to stop after not being able to hold on at all. He couldn't even safely jump a triple on the practice track. After sitting for a couple days, Tedesco rested the injury in hopes of being able to race in Michigan. He made the trip up the wintery city and gave it his best shot. He tried to put in some hard laps in practice one, but the difficulty was too much to overcome. It wasn't about the pain for him, that's doable, but about his grip. He was almost landed on when he had to back out of a triple and Ivan and the team decided he better sit this one out. Ivan Tedesco: "I had a crash in Daytona and busted my finger so I wasn't able to ride all week. I came up to Detroit to give it a shot but just couldn't hold on, so I decided not to race. Going to do therapy on it all week and hope to be able to race up in Toronto." Cole Thompson was having one of his best days of the year in practice and looked poised to carry that result into the night show. The track suited him well and he looked very good, also posting competitive lap times with the leaders. He once again had a successful heat race, putting in a solid ride and qualifying for the main with ease. Then trouble struck again when it counts, on the first lap of the main event. Thompson was in the very back from the get go and on this track he was going to need to ride flawlessly to even get back into the top ten. For the first 2/3 of the race he did just that. He moved into 10th at one point and had a pack of 4 riders in front of him that he had a chance to get around. When Alex Martin made a mistake in front of him, Cole dove to the inside to get by him and another rider entering a rhythm section. Thompson's front wheel just pushed out on the slick surface as he was going up the jump face and he went down. He was able to repass a couple riders but ran out of time. Cole Thompson: "I had a bad start in the main and then had some trouble in the first rhythm. I started to make my way up and then had a slide out on lap 11. There was a group of guys in front of me I was trying to get around. I ended up in 11th." The team now will head to the only international round of the series next week in Toronto, Ontario Canada. Tedesco will work all week to rehab his injury and return to racing. Thompson will look for redemption from his past few races. He will be doing so in front of a home crowd as he hails from Canada.